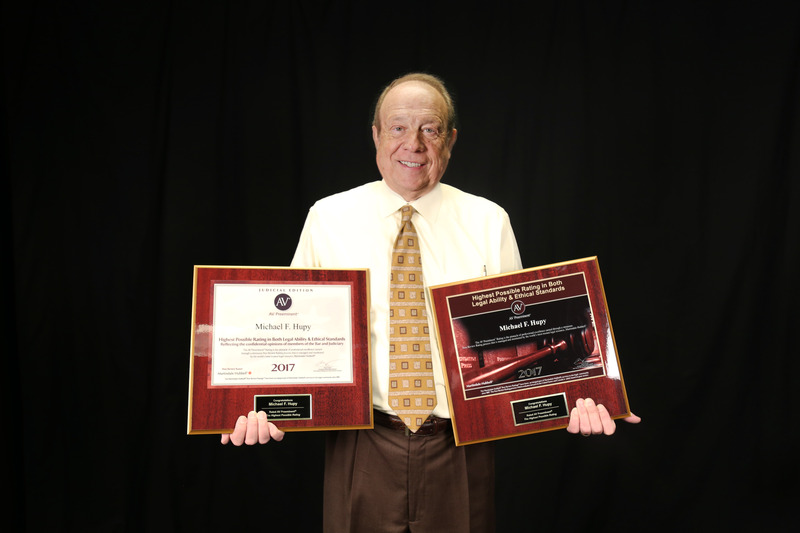 SOURCE: Hupy and Abraham, S.C.
MILWAUKEE, WI--(Marketwired - April 20, 2017) - Attorney Michael Hupy was recently recognized as an AV Preeminent Attorney -- Judicial Edition -- a prestigious award based on review ratings of members of the judicial community. Attorney Hupy has been peer reviewed AV Preeminent Rated by Martindale-Hubbell for more than 20 years. Lawyers are surveyed on a lawyer's legal ability and ethical standards. Those survey results turn into a rating after a threshold has been achieved. The AV Preeminent judicial rating is the gold standard of lawyer ratings -- the highest possible rating in legal ability and ethical standards -- and has been since 1887. This award is compiled from judicial opinion about an attorney and is the pinnacle of professional excellence. Receiving this award is a sign that a lawyer has reached the highest possible standard of legal knowledge and ethical behavior in their field. It also is a reflection of opinions from both the judiciary and the bar. Recognized with a Litigator Award in 2015, Attorney Hupy was also named a Wisconsin Super Lawyer. Over his decades of practice, he has been involved with several lawyer organizations and is a member of the National Trial Lawyers, the American Association of Justice and a member of the Million and Multi-Million Dollar Advocates Forum. Additionally, Attorney Hupy is past president of the Wisconsin Association of Criminal Defense Lawyers and a member of the Wisconsin Association of Justice Board of Directors. Founded in 1969 in Milwaukee, Wisconsin, personal injury law firm Hupy and Abraham, S.C. has a proven record of success with large settlements in serious cases, collecting over a billion dollars for more than 70,000 satisfied clients. The firm has a long-established reputation of providing sound legal representation to accident victims, securing fair compensation for its clients and giving back to the community. The firm's 25 experienced attorneys are committed to going above and beyond the call of duty for their clients by tirelessly representing them to the best of their ability while being involved in the local community -- from raising funds for local charities to participating in safety and accident prevention initiatives. In the past three years, the firm has donated more than $500,000 to more than 250 worthwhile causes. Hupy and Abraham, S.C. has received top ratings from a number of national professional organizations for many years and was voted Best Personal Injury Lawyers in 2016, 2015, 2014, 2013, 2012 and 2011 and voted Best Personal Injury Law Firm in 2016, 2014, 2013 and 2012 in another popular poll, and named Best Law Firm in the Milwaukee Journal Sentinel's Top Choice Award in 2015 and 2016. In 2015, the firm was named a Webby Award Honoree in the Best Law Website Category and was honored at the Legal Marketing Association's "Your Honor Awards" for Best Website: Reboot. About this company Hupy and Abraham, S.C.